Fritillaria is a genus in the Liliaceae family distributed throughout Europe and North Africa (especially around the Mediterranean), temperate Asia and North America. Most of them have pendant flowers but many of these are not brilliantly colored although they may have attractive markings. Some of the species have a "foxy" odor. The name of the genus is said to come from the latin fritillus or dice box. Many of the species have spotted or checked flowers. Fritillary or fritillaries is also a common name for butterflies in the family Nymphalidae, again deriving from their patterned wings. John Gerarde, page 123, in his book The Herball, or Generall Historie of Plantes published in 1597, says the name may derive from the tables at which chess or dice was played frittillo. Fritillarias are among the easiest and most reliable genera from seed. Generally the seeds should be sown in fall or early winter, watered, and kept outdoors in the cold they germinate the following spring. If they are not sown until after Christmas it becomes increasingly likely that they will wait until spring year (Jack Elliott). Jane McGary noted that F. camschatcensis, F. meleagris, and perhaps East Asian wet growing species have very short viability. These seeds should be sown right away. California Fritillaria need about four months of cold/cool weather to germinate well. The seeds have been stored for three years and germination was good when allowed a sufficiently long germination period of at least four months (Diana Chapman). See also Fritillaria Germination. Jane McGary who has tremendous experience in growing this genus formerly grew her plants in a bulb frame where they were protected in the winter, sometimes even when temperature reached 20 °F (-6 °C). They were in clay pots plunged to the rim in coarse sand. They are now in raised beds in a roofed bulb house with wire mesh walls. During growth, the plants are given full sun (in the Oregon winter) and fertilized once in the fall and three times during the winter-spring growing season with a "root and bloom" formula. During the summer dormancy period one bed receives a little water and the other, none. John Lonsdale suggests a porous alpine type (1:1 organic:inorganic) mix for growing these plants. More Fritillaria photos can be viewed from the Fritillaria Group of the Alpine Garden Society. 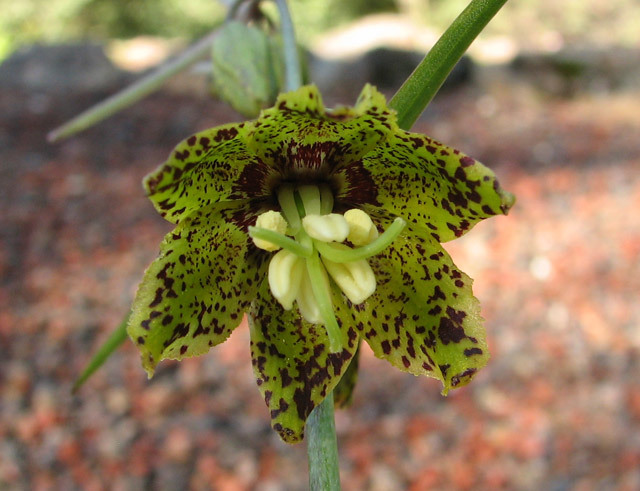 Fritillaria Icones is a photographic botanical database of the genus.